The Easter Holidays are here once again, and for the San Pedro Roman Catholic Church this is the most holy time of the year. The celebration of Christ’s death and resurrection was ushered in by the 40-day Lenten season which commenced on Ash Wednesday, February 10th. As such the Church has scheduled a series of events to celebrate the Holy Week. The Lenten Season culminated on Sunday, March 19th with the Palm Sunday possession. Observed as the day Jesus returns to Jerusalem, symbolic palm leaves, which according to the Bible were used to welcome Jesus to the holy city, are revered by the Catholics during this day. Here in San Pedro Town the procession started shortly after 3PM. 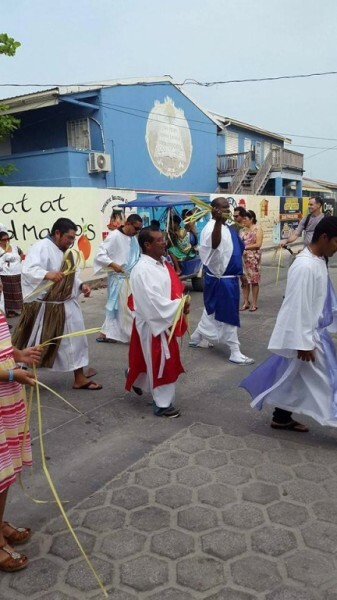 Leading the procession were members of the congregation dressed up as the 12 Apostles and Jesus. The procession culminated with the Palm Sunday mass, where palm leaves were blessed and given to the congregation, which turns them into crosses as a token of their faith. The next scheduled event was held on Holy Thursday, March 24th. The traditional “Washing of the Feet” ceremony, which commemorated The Last Supper, took place at 7PM at the Roman Catholic Church, followed by the transfer of the Holy Eucharist to the Parish Hall at 10AM. The Adoration Vigil was then held at the Parish Hall until midnight, which is the time Judas betrayed Jesus at the Garden of Gethsemane, and is the beginning of Good Friday. The holiest of days to Roman Catholics is Good Friday, March 25th. This is the day Christ endured suffering and death to cleanse his people’s sins. 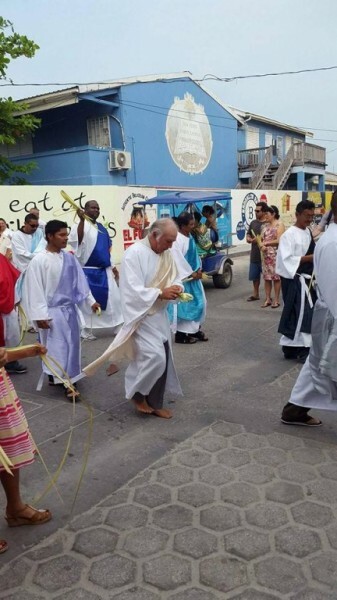 To honour this day, the San Pedro Roman Catholic Church is to hold the 14 Stations of the Cross procession starting at 4AM from the San Pedro Catholic Church on Barrier Reef Drive. This will be followed by The Seven Last Words Ceremony at 12PM, and the Celebration of the Passion of the Lord mass at 3PM. At 5PM, the congregation once again will gather in front of the Church building for the Holy Procession (El Santo Entiero). A casket symbolizing the body of Jesus Christ will be carried by the men, while the women carry the statue of The Virgin Mary. The procession will move through the main streets of San Pedro in a solemn walk of reverence. On Holy Saturday, March 26th an Easter Vigil Mass will be held at 7PM at the Roman Catholic Church. Celebrations continue on Easter Sunday, March 27th with the 7AM Encuentno, when Catholics rejoice in the resurrection of Jesus Christ. Masses will be held at 10AM (English) and at 7PM (Spanish). The Easter celebrations will end on Easter Monday with a mass at 7AM. The San Pedro Roman Catholic Church invites all those who wish to attend the Easter celebrations to join the San Pedro Congregation. Easter Weekend 2016 was quite the ‘eggstravaganza’!